What is a clear vinyl weather curtain? Clear vinyl weather curtains are exactly what they sound like. They are a curtain made from clear vinyl with an opaque border that is installed directly on your patio openings. They are motorized so that they roll down to deploy and retract with the touch of a button. These modern, beautiful curtains are designed and exclusively customized for each business. This means that they always look perfect. The ambiance of your outdoor dining area is matched by our screens. They’re designed to blend into your already existing patio design when they’re not deployed. Fenetex Clear Vinyl Weather Curtains are the perfect final touch. Turn your restaurant’s outdoor dining space into the best seats in the house. 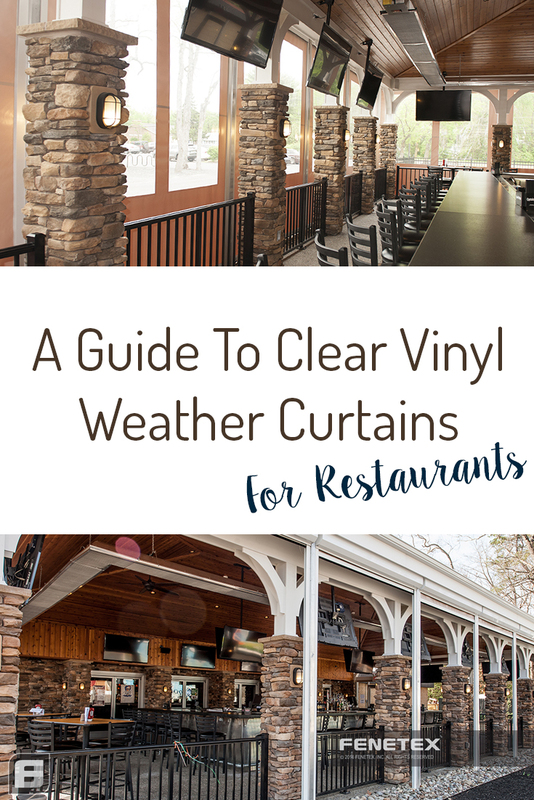 How Can Restaurants Benefit from Clear Vinyl Weather Curtains? Clear vinyl weather roll down curtains are the perfect addition for any restaurant outdoor dining area. 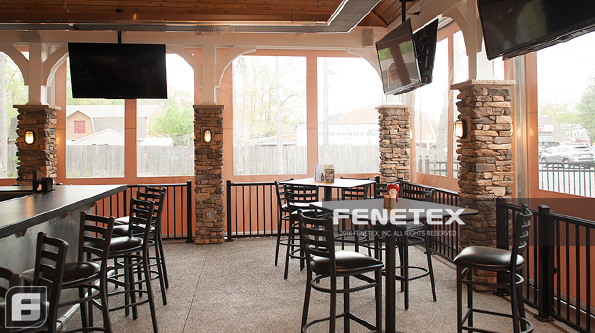 They enclose your restaurant patio while still maintaining an open-air feeling and a full view. 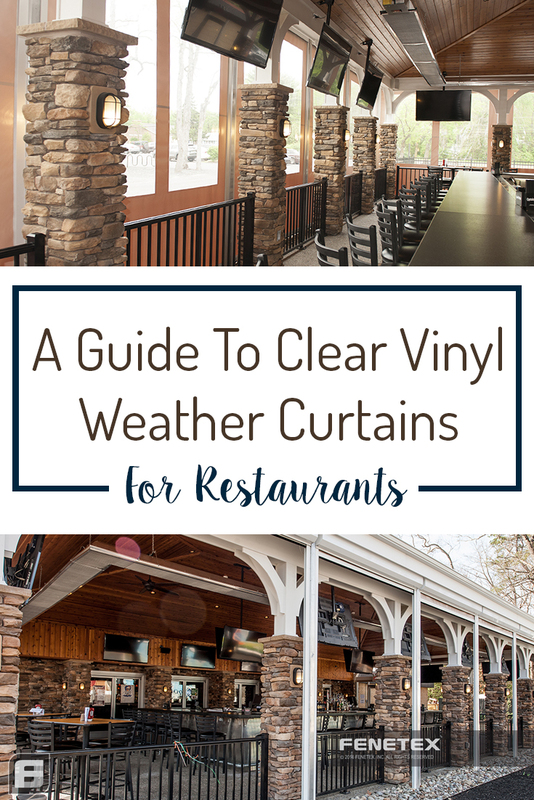 Clear vinyl weather curtains offer your restaurant the best of both worlds. With clear vinyl weather curtains, you’ll never sacrifice tables and revenue to inclement weather again. We know your concerns about outdoor seating change with the seasons. In the summer it’s all about keeping the heat and sun out. In the winter you want to keep the chill-out and safely heat the area. You also worry about keeping your guests dry and comfortable in the rain, snow, and heavy winds. Vinyl weather curtains offer the perfect solution for any commercial outdoor dining area for all of these concerns. Clear curtains instantly weather-proof your outdoor seating area. The vinyl is wind and rain resistant by nature. This is perfect for keeping your customers dry and comfortable when eating outside. Vinyl screens also help maintain the air temperature inside. They keep the air conditioning in during even the balmiest summer days. Our clear vinyl weather curtains are NFPA rated fire resistant. Feel free to crank up the heat with space heaters or fireplaces and our screens will hold in all that toasty air. How Can I Get More Information about Clear Vinyl Weather Curtains? Contact us to create the perfect outdoor dining experience for your customers. Fenetex Clear Vinyl Weather Curtains are our newest innovation and we’re proud of them! We can’t wait to talk to you about all the benefits and applications of these screens. We’ll help create a plan that is customized to your business’s needs. From the first preliminary design drawings to the installation. We will be there for your curtains’ first trip down their tracks. You and your customers will love the results. We can’t wait to hear from you!